The town of Summerville, fondly called "Flowertown in the Pines." welcomes newcomers with open arms and sincere Southern hospitality. Known for its rich history, towering pines and beautiful azaelas, Summerville is also proud to introduce its newest residents to a local, regional and indeed national hero - Coach John McKissick. Like many small Southern towns, Summerville has a passion for football, especially since it's the home of the "winningest" football coach in America, John McKissick. 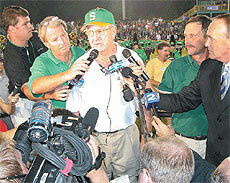 McKissick, 77, has coached the Summerville High Green Wave to 510 victories and 120 losses and 10 state championships in his 51 years at Summerville High School. The most recent championship came in 1998 with a 31-23 victory over upstate rival, Gaffney. For all his success, he has earned a spot in the history books with two articles in Sports Illustrated and a number of appearances on television, news magazines when he coached his recordbreaking 406th victory in October of 1993 against Wando High School in Mount Pleasant. He also co-authored, along with Billy Baker, a book titled "Called to Coach." This past season McKissick proved a person doesn't have to live in New York City or coach at Notre Dame to achieve greatness. McKissick brought the bright lights of the big city to him and the small town of Summerville, population 27,752. On the cool autumn night of Sept. 12, McKissick etched his name in the annals of football when he became the first coach at any level to reach 500 victories in 52 season of coaching football. The Green Wave defeated the Wando Warriors 34-17 at John McKissick Field in front of 11,504 fans. "There is a lot of places to coach football," McKissick said. "But none are better than playing here. I have helped put a little town like Summerville on the map." When people ask McKissick why he's been so successful over the years, he always responds. "I've surrounded myself with a lot of good coaches and I've had some good players that have made me look good," he said. McKissick added, "I think another thing that helped me along the way is I always have stressed to my coaches never tell a player what he's doing wrong. Instead show him how to do it right. Always be positive." Before McKissick became the legend that he is today, his journey began in the quaint town of Kingstree, S.C. about 60 miles north of Summerville. He and his family moved there after his seventh-grade year in 1940 from Lake City, S.C.
McKissick's love for football began when he played midget football in the eighth grade with his good friend Frank McGill. McKissick played running back and McGill played fullback on the offensive line. From midget football, McKissick went on to play football at Kingstree High for four years. Even then those around him knew McKissick would one day be a football coach. Kingstree's 1944 Class Prophecy, written by Ellen Swails, foretold of McKissick's future endeavors. Swails wrote ". Coach John McKissick of Yale, who was returning from Duke, where he had been visiting Coach Frank McGill." Swails had his profession correct, but the wrong school and level of play. Nonetheless, McKissick did become a coach. After graduating from high school, McKissick attended five different colleges and played football at four colleges. In 1951 he graduated from Presbyterian College with a degree in Economics. With the itch to coach football McKissick returned to Kingstree in 1951 and applied for the head coach job at his alma mater. However McKissick was turned down for the position due to lack of experience. "I would have turned me down, too," McKissick said. "I didn't have any coaching experience, and I was right out of college." Upon being rejected McKissick went to work for a finance company, but quickly left to coach a six-man football team in Clarkton, N.C. Then in 1952 McKissick landed the coaching job at Summerville High and became a coaching legend. Shortly before beginning his coaching duties at Summerville High, McKissick married his hometown sweetheart, Joan Carter. They married on June 28, 1952 and are still married today. For 51 years, McKissick has been at Summerville High molding teenagers into football players. During his tenure he has won an average of 10 games a year for 51 seasons, and in that time has only had two losing seasons. To put this into perspective a coach could coach 30 years, win 15 games a season and still be 150 wins short of 500 wins. What makes McKissick's players different from other players in high school is he demands discipline. Every player on McKissick's team has to have a good haircut, wear no earrings and every player dresses the same on game days. Every player wears the same color shoes and socks (pulled up to the knees) with their uniform. Everybody looks the same on game night - there are no individuals. "If your going to be a team you've got to look and act like a team," McKissick said. "Each player has to work towards the same goal and that's winning the game." McKissick has racked up seven undefeated seasons and two most successful streaks happened from 1978 to 1980 and 1982 to 1984. During the 1978 to 1980 stretch the Green Wave won 41 consecutive games and two state titles and a runner-up. The streak ended with a loss to Irmo in the 1980 State Championship game. Summerville had defeated Irmo in 1978 and 1979 to win back-to-back state titles, but in 1980 the Yellow Jackets stung the Green Wave 13-0. 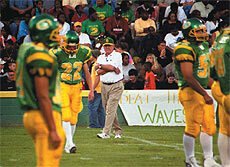 The loss ended the longest winning streak in McKissick's time at Summerville. In 1982 the Green Wave began another streak, winning three consecutive State Championships. Summerville went 13-1 in 1982 and defeated Spartanburg 23-12 in the title game. The following year the Wave went 13-1 and defeated Gaffney 21-7; in 1984 the Wave went 14-0 and defeated Spartanburg 23-12 for its third straight state title. From 1978 to 1986, McKissick and Summerville won six of 10 State Championships. 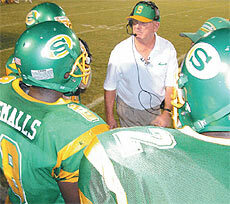 Through 51 years at Summerville High, McKissick has coached 3,014 teenage boys. The most amazing aspect of it all is he has never cut a player who has tried out for the Green Wave football team. As long as McKissick is coaching at Summerville High, the town of Summerville will be known for its azaleas, towering pines and prep football at Memorial Stadium on Friday nights in the fall.